When consumed orally, these stilbenoid compounds are absorbed into the body through the intestine. As they move into the blood stream, they pass through the liver. They are altered by the liver, where glucuronide or sulfates are attached to them, marking them for elimination from the body as part of the liver’s function in eliminating toxins. These tags are attached to the hydroxy groups (HO/OH) on the stilbenoid compounds. 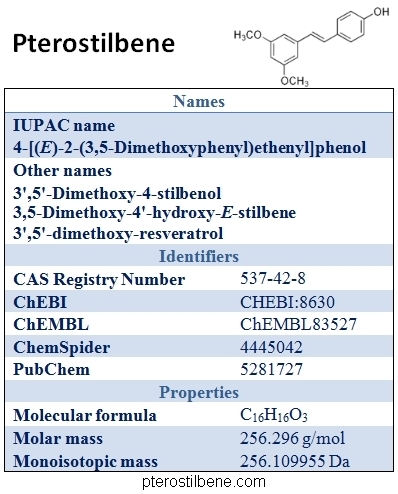 This does not happen to Pterostilbene’s methoxy molecules (H3CO/OCH3), so there is only one site that can be marked. With three hydroxy groups, resveratrol can more easily be tagged and therefore eliminated rapidly from the body. This gives Pterostilbene over 7 times more time to reach areas where it is needed via the circulatory system and be absorbed into cells. Studies in rats report that a 150 mg/kg oral dose of resveratrol produces a serum concentration that is almost 100-fold less than the serum concentration of a 68 mg/kg oral dose of pterostilbene shortly after administration, and by 12 hours post-dosing serum levels of resveratrol have started dropping towards zero. An oral dose of 168 mg/kg of pterostilbene maintains a very high serum level for over eight hours after administration, and doesn’t decline towards zero until almost 24 hours after administration. (1) These results clearly suggest that pterostilbene may be the preferred protective agent for practical use.